Modern Nativity finally provides your home with the perfectholiday gift. 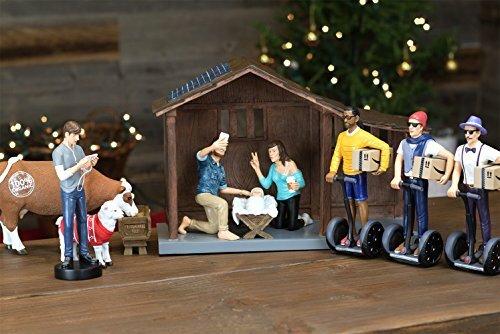 A reimagining of the Nativity Scene, with hipsters, selfies, segways, and more! Each piece is hand painted and made of durable polyresin. Each standing figurine is 7" tall. Complete set includes the entire cast of characters and the stable, displayed at 24" x 16". Mary showing off her high cheek bones with her best duck face. Joseph rocking his man bun and finest denim shirt. Baby Jesus resting in a manger. The Three Wisemen rocking their favorite hipster outfits on segways with gifts. The Shepherd, Instagramtagging the event from his iPad, accompanied by his animals. A Sheep sporting its winter sweater. A 100% Organic Cow munching on its Gluten-Free feed. Finally, the Stable comes fully equipped with an eco-friendly solar panel. We're sure you'll love using our Hipster Nativity Set. In fact, we're so sure of it, that we'll provide your money back if you don't fully enjoy our product. THE PERFECT HOLIDAY GIFT: Finally, a modern take on the Nativity Scene that everyone will love. QUALITY CRAFTED: Standing figures are 7" tall, 100% hand-painted, and made of durable polyresin. ENTIRE SCENE INCLUDED: Complete set as displayed is 24" x 16". MEET THE CAST: Set includes Mary, Joseph, baby Jesus and manger, 3 wisemen on segways, shepherd, sheep, cow, and stable. 100% SATISFACTION GUARANTEE: You're going to love displaying our Hipster Nativity Set. In fact, we're so sure of it that we offer a 100% Money-Back Guarantee if you're not completely satisfied! If you have any questions about this product by Gorilla Goodies, contact us by completing and submitting the form below. If you are looking for a specif part number, please include it with your message.